I'm kind of addicted to vintage decorating & woodworking books. I've amassed quite a collection and am always on the lookout for more. They're not just a look back into the past, they're also full of amazing inspiration for modern decorating, especially if your taste leans towards retro modern or MCM like mine. Just look at the cover to the left...nix the green carpeting (and the green paneling if you're so inclined) and you've got a gorgeous modern room. I like the geometric prints on the rug and wall tapestry. I wish I could see what is in the lower right corner. Looks like some kind of platter with a tribal print. This is one of my favorite rooms. 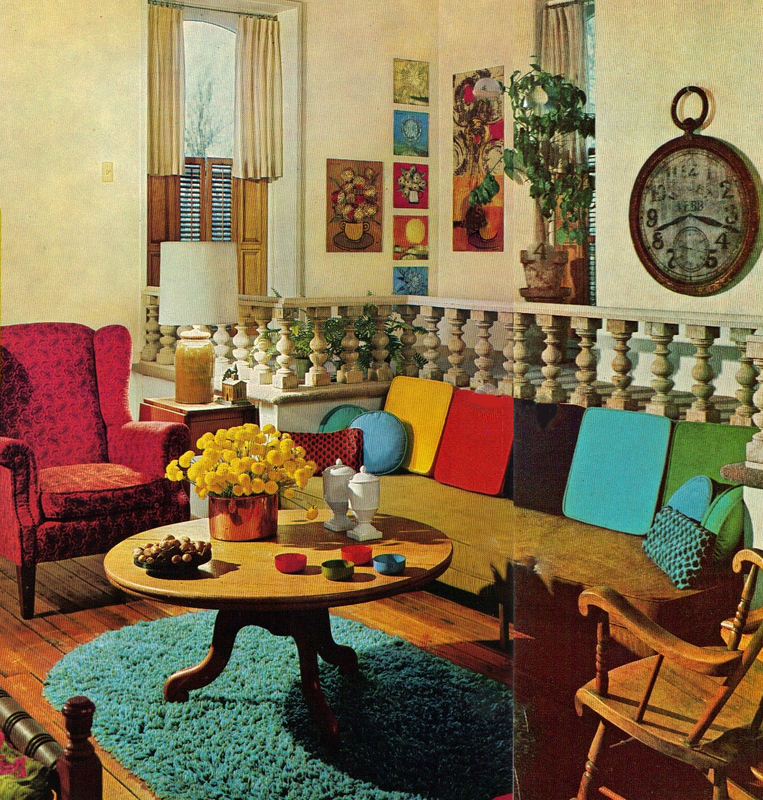 The multi-colored pillows, blue rug, worn wood floors, and art on the walls are amazing. Oh, and look at those colorful bowls on the coffee table. I'm not a fan of the arm or rocking chairs, but other than that I'll take it! I was a newlywed in 1968 and decorated much like the second picture. I had some hand-me-down Early American furniture very much like that armchair and rocker mixed in with more modern pieces...and a whole lot of shag carpet. Ah, what memories those pictures bring back of "setting up housekeeping," as we called it back then. You're so right. Why didn't I think of that! My tray idea didn't even make sense!